I am coming to you today with a Trader Joe’s grocery haul! I have a couple of new items and also a few that I find myself buying over and over which means… They are awesome! Before I get into the haul I do want to talk to you a little. I have been so off of my blogging game! I have really taken this summer to reflect and relax. I haven’t posted much at all, and that kind of makes me feel guilty. I feel guilty because I love this blog, and I love that you come here to read it so I want to keep it up for the both of us. 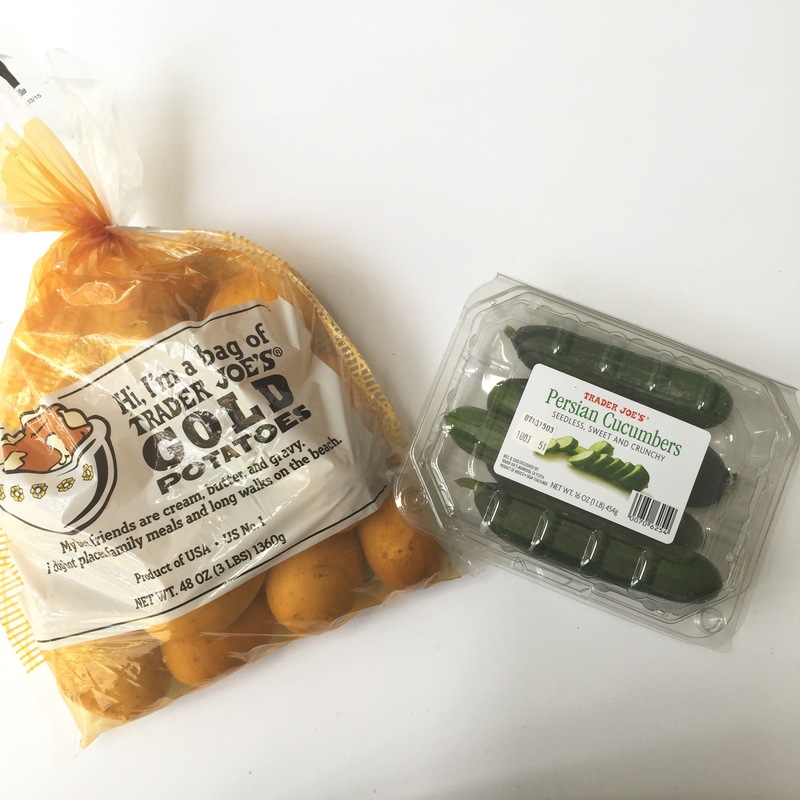 Produce: I got our favorite gold potatoes as well as the little Persian cucumbers. My husband and I love eating these cucumbers sliced up with lime and sea salt! 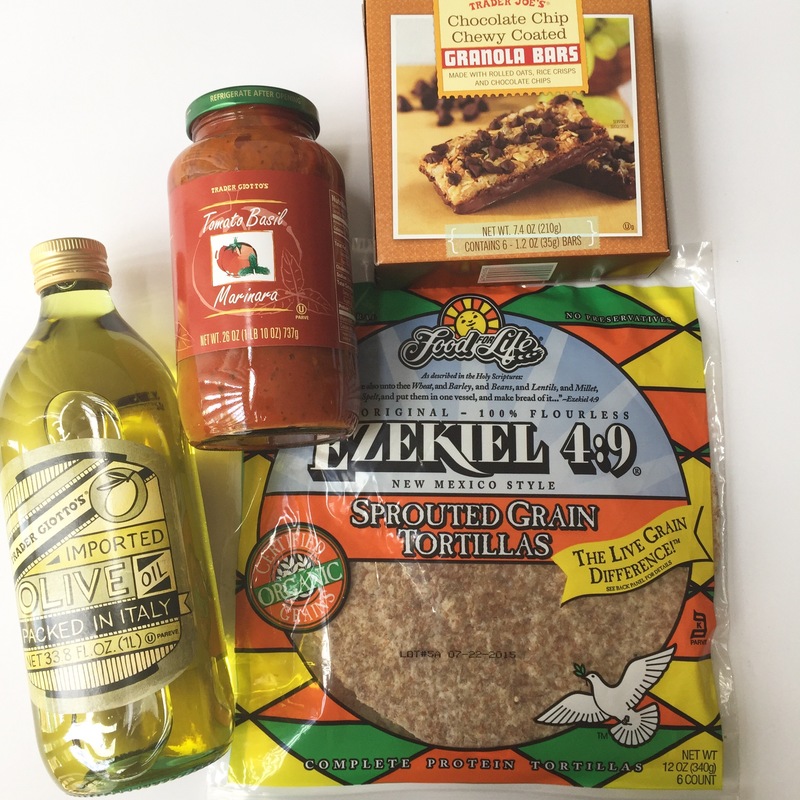 Pantry: I really wanted to try the Ezekiel tortillas because I always hate wheat tortillas, but I heard these were good! I liked them! I used them to make quesadillas and also a wrap… They definitely taste heathy. We also tried the chocolate granola bars. The bars were good, but they were a little too sweet for us! The chocolate coating is really thick, and they are not the healthiest. Lastly, I got marinara and olive oil. 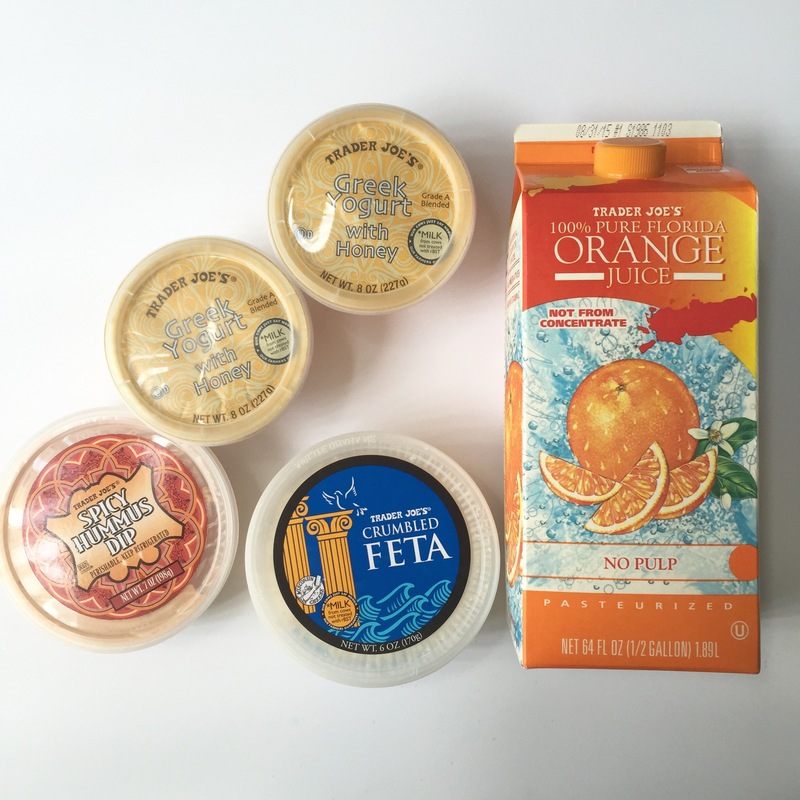 Refrigerated: I picked up my fave orange juice. New items were: feta, spicy hummus and Greek yogurt with honey. I really liked the hummus and feta, but I didn’t really care for the yogurt because it was too thick for my liking. Also, the flavor was just a little off for me. Frozen: Tommy loves this chicken fried rice, like a lot! We’ve bought it many times. 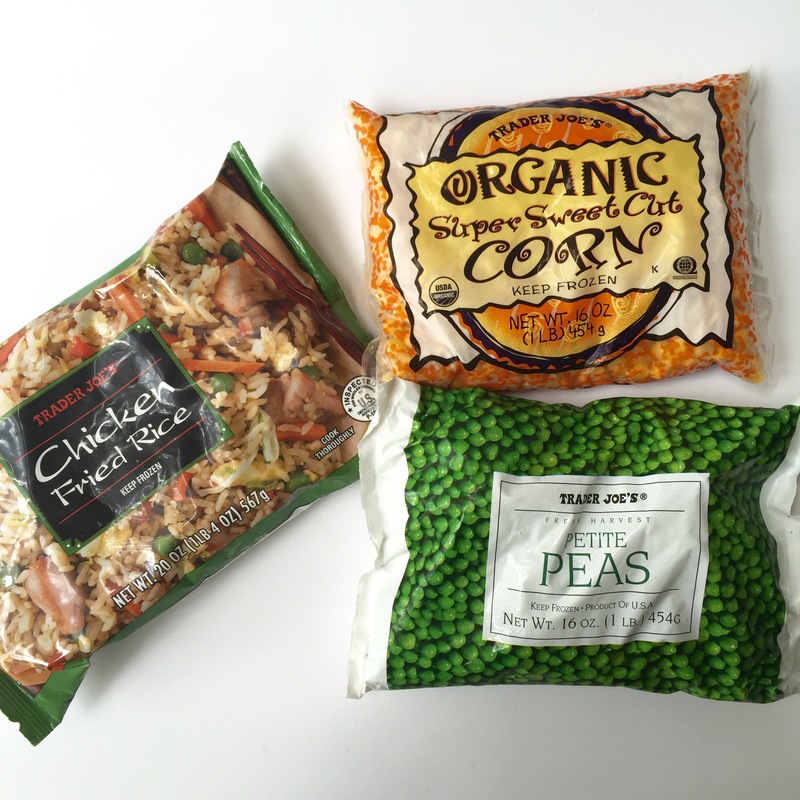 I also got peas and the super sweet organic corn. 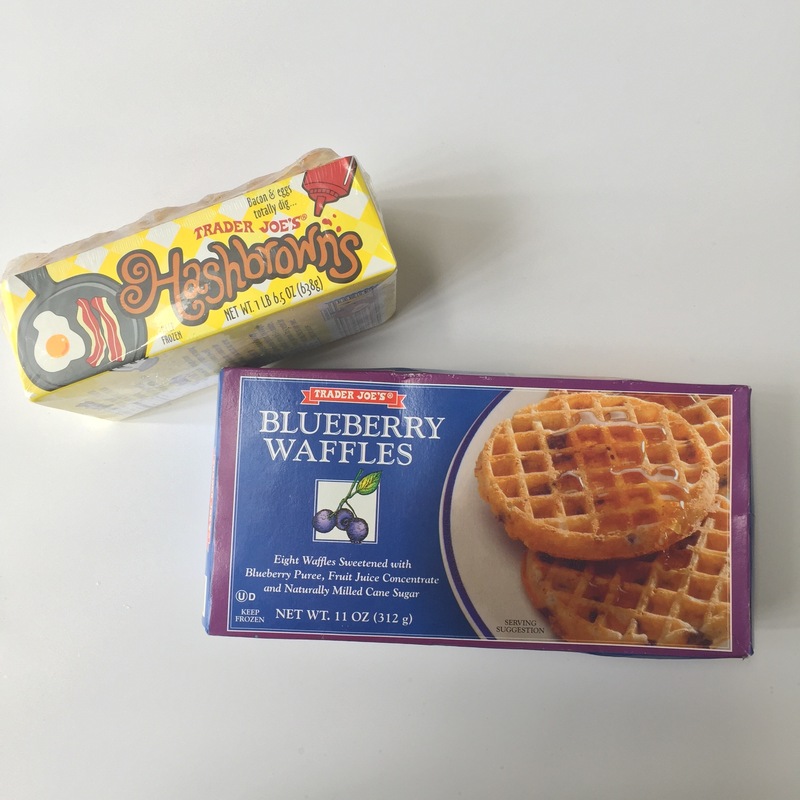 Frozen breakfast: I loved the blueberry waffles, quick and easy to make in the toaster. Tommy really liked the hash browns. They are also so easy to make in the toaster oven. 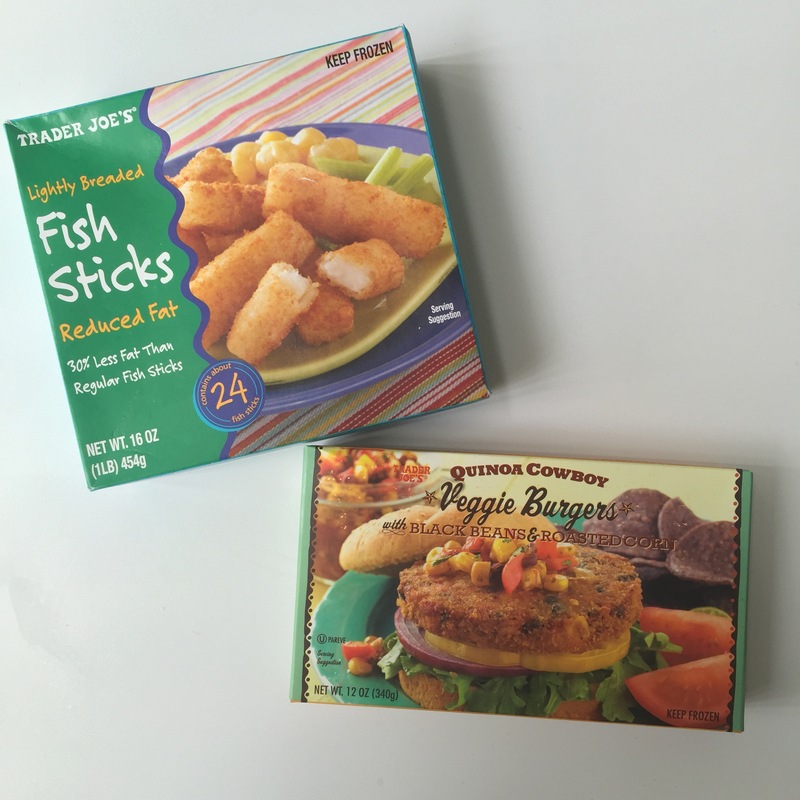 Frozen Protein: These fish sticks are the bomb. I bake them in the oven like the directions say, but then I also broil them on both sides so they get super crunchy. I really enjoyed the Quinoa Cowboy veggie burgers. I am usually a big fan of veggie burgers. 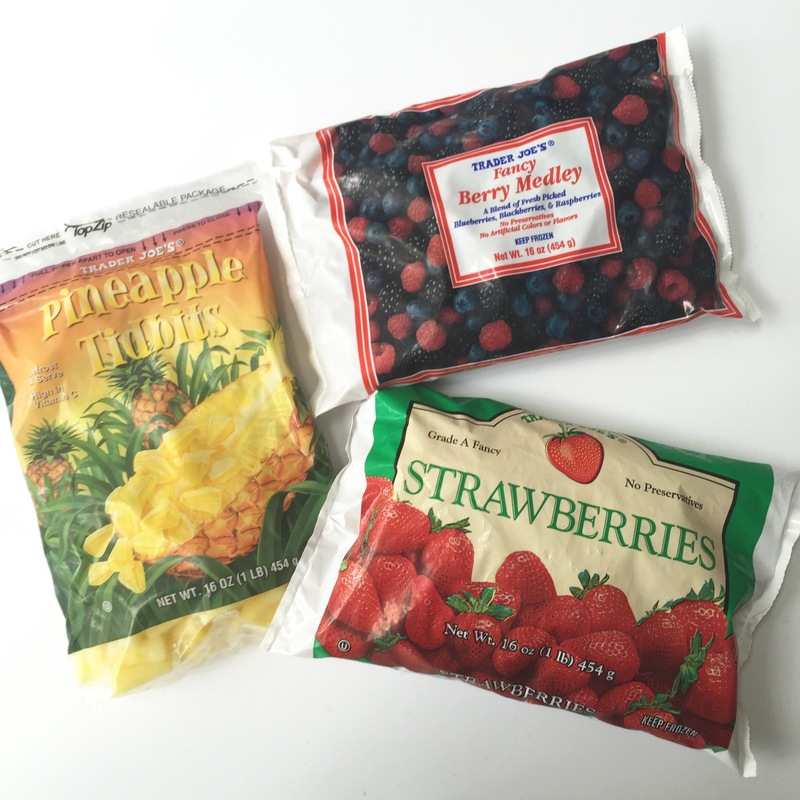 Frozen fruit: Trader Joe’s is my favorite place to buy frozen fruit for smoothies! The fruit is always good and they have such good prices. Some of this fruit may have gone into sangria instead of smoothies. Shhhh! Just sayin. Flowers: Having fresh flowers at home just feels good. I picked up these pretty flowers for like $3 or $4. 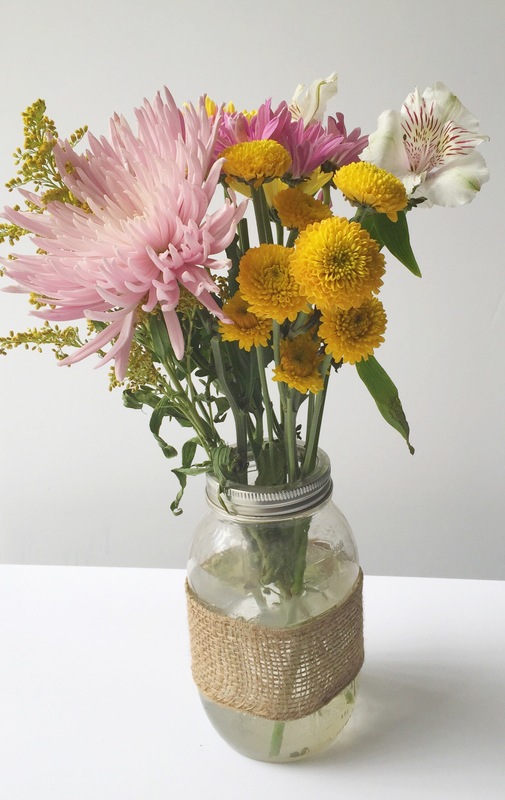 The little yellow ones remind me of our wedding, and they burlap mason jar is from one of our wedding center pieces! Hope you enjoyed this TJ haul. They are always fun to do. 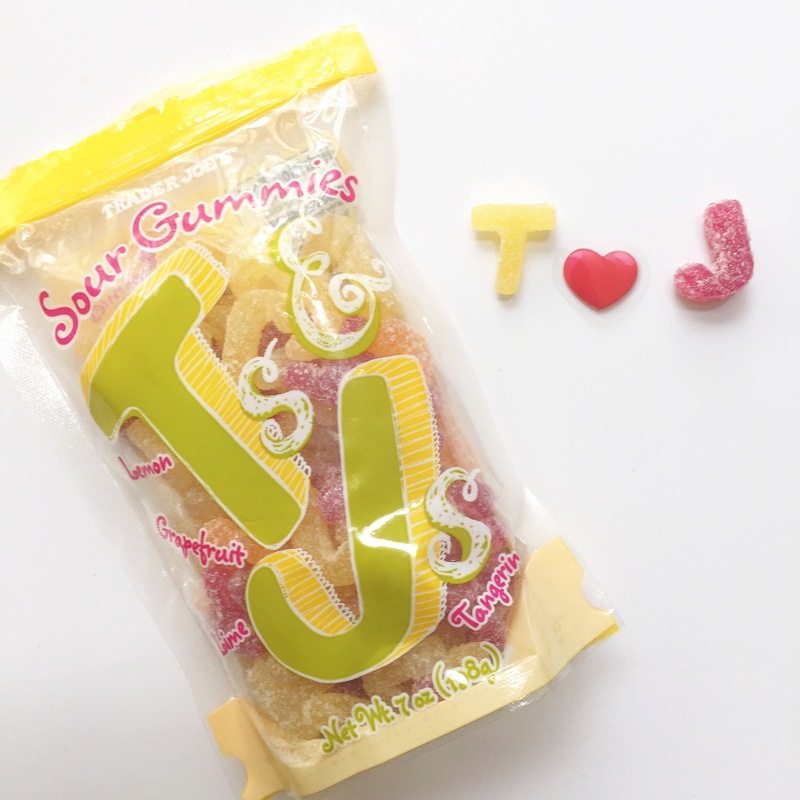 As always… If you want to share your favorite TJ items with me let me know in the comments. I love trying new items! I love Trader Joe’s! On my last run (Sunday), I spent $143. I cannot get out of there for less than $100. That’s partially because I only go around every 4-6 weeks, but also because I just keep throwing more and more stuff into my cart. Try the dark chocolate covered almonds with sea salt and sugar. Seriously……they are ah-mazing. Yes, it is so easy to throw items into the cart at Trader Joes! Lol. I usually go once or twice a month. I will have to try those almonds!! I recently started buying the little pack of dark chocolate peanut butter cups, and they are also amazing!!!!!! The bag is only 99 cents and it has about 6 individually wrapped cups. I will eat 1 or 2 a day until they are gone… They are so delicious! I love their croutons, sriracha and garlic bbq sauce, and ceaser dressing. I love their croutons too, they are so fancy! Lol I have to try the garlic BBQ sauce. Thank you for the recommendation!